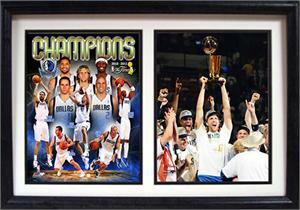 2011 NBA Champion Dallas Mavericks Highlighting Dirk Nowitzki 12X18 Double Print Custom Frame. Celebrate The 1st Championship of the Dallas Mavericks and Dirk Nowitzki with this wonderful 12X18 Double Print Deluxed Frame memorabilia. This Wonderful Piece of Memorabilia Is Double Matted and Professionally Framed. This Is a Must Have for Any Mavs Fans!